Select No to disallow text communications. List your current/previous medical school program as well as your college/university from which you obtained your undergraduate degree if applicable. ARE YOU ELIGIBLE FOR RE-ADMISSION? Applicants whose native language is not English must demonstrate an established level of English language proficiency through the Internet Based Test (iBT) of the Test of English as a Foreign Language (TOEFL) or the academic format of the International English Language Testing System (IELTS). The test must have been taken within the two years of the first term of enrollment. If your native language is not English and you have taken either of these tests, please be prepared to produce your scores. An official report of your scores must be sent directly to the Office of Admissions from the testing agency before an admissions decision can be made. Please list ALL attempts and scores for the USMLE Exams below. In this section please provide us with more insight into who you are, what your motivations, goals, reason you are seeking a career in medicine or anything you"d like to share about what makes you a strong applicant for our MD program. In this section please provide us with of previous healthcare experience in either an employment of volunteer capacity. Please indicate why this was meaningful and total amount of time in which you were engaged. In this section list academic awards you have received, describe any research experience you have had, and list any publications you have. For articles, include name of article, co-authors, name of publication, date, number and volume. For books or chapters, include name of book, editor (if any), publisher, and date of publication. Please upload your MD program transcripts and if applicable USMLE Step exam reports to expedite the review of your advanced standing admission. If you experience difficulty loading your documents, you can send them by email to admissions@trinitysom.org once you have submitted the application. Please plan to have two letters of recommendation submitted on your behalf directly from your letter writers. One of the letters must be from your previous medical school's Dean's addressing your academic and professional performance, and reason for dismissal (if applicable). Letters may be submitted by the author of the letter directly via email to admissions@trinitysom.org . Letters submitted by you WILL NOT be accepted. By checking this box and entering my name and today"s date in the spaces below, I certify that the information submitted by me on this application is complete and accurate. I understand that withholding requested information or giving false information may make me ineligible for admission, cause me to be dismissed from Trinity School of Medicine or have my degree rescinded, if application. 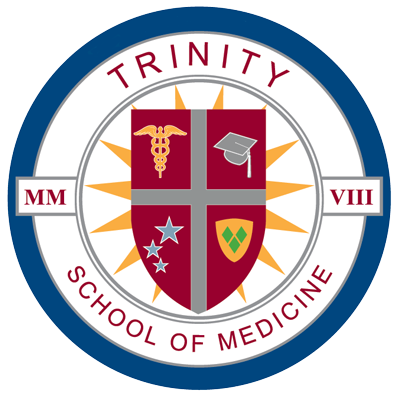 If I accept an offer of admission from Trinity School of medicine, I understand that I am subject to the rules, regulations and policies of Trinity School of Medicine as they now exist or as they may be modified in the future, and I understand that the rules, regulations and policies of Trinity School of Medicine are subject to change without notice. APPLICATION FEE: Your file will not be complete until you have finalized the PayPal application fee process. You will be taken to PayPal upon clicking the "Submit Application" button.